They were SO much fun to make, and they’ll be even more fun to give away as gifts . . . with a cupcake or muffin tucked inside! I first saw them on Pinterest, which led to the amazing Amy Powers’ Inspire Co. blog, which led to the Etsy shop of Claudine Hellmuth. The downloadable kit includes all five oven colors, a removable cupcake tray, cupcake flags (on which you can type your OWN message! ), and adorable oven mitt gift tags. You can read about Claudine here . . . what an IMPRESSIVE resume! And check out her other fun downloadable kits, too! Oh, BRILLIANT!! What a great idea! The inventor should be very pleased. Oh my gosh. These are precious! And take me back to my childhood. 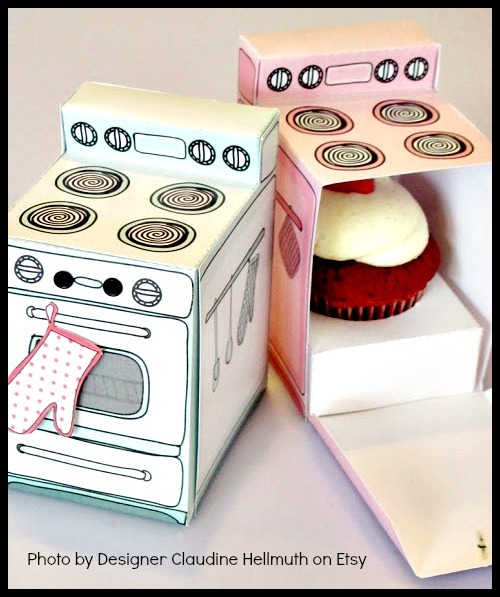 I had a retro oven in my dollhouse…but never did I open it to find a yummy cupcake inside. LOVE. Oh, this is so up my alley. The cutest! ADORABLE, bookmarked for the next shower party. Thanks for sharing Katherine. Did you find them pretty easy to print/cut and assemble? Love this idea. Will check these out on Etsy. Thank you so much for blogging about my oven boxes! I am so thrilled that you love them! They are so beautiful! What a fabulous idea!! Thanks for sharing! What a terrific party favor! Thanks for sharing. Oh my god! AWESOME! And the fact that they are cupcakes holders makes them even better! I have nominated your blog for the Liebster Award! Your blog always brings me joy! What a perfect little hostess gift or for a housewarming party. Love them! Thank you! I miss the like button too! That is one of the cutest things ever!! Absolutely adorable. They are just too cute – how creative!! Oh these are super cute! Eeeeep these are SO CUTE! Love them! What a cute way to give a cupcake. SOOOO CUTE! i love them! Could these be any more adorable! Adorable, they made me smile. I will go and click on the link now and find out more. cheers. They are super cute and a brilliant idea! Who can resist anything cupcake!?! Just love this little oven!! These are adorable! I have to get some! Thanks! That’s the cutest idea. I’ll check this out. GREAT FUN! I love the idea of a cake inside, freshly baked, brilliant. I know this is an older post, but I can’t believe no one thought of these as baby shower favors with BUNS inside! Adorable! She did have some of those on her blog! And one of the signs that comes with the kit says, “Bun in the oven.” 🙂 Such an adorable idea!